It's been a while since I posted but, as usual, things have been busy. I don't get pay, recognition, or much else for writing a blog - it's mostly for my own benefit and to encourage my writing. If others find it interesting or useful, that's an extra benefit! Anyway, a few days ago, my family and I, along with another family, spend a couple of days at Watkins Glen (camping in the State Park - yes, it was raining much of the time). The town of Watkins Glen is located at the southern end of Seneca Lake, the largest of the Finger Lakes in central New York. While many people may associate the town with NASCAR racing (sorry, simply don't see the appeal), its most interesting feature is a stream-carved gorge now preserved as a State Park. I'm in the beige rain jacket. My wife has the white sneakers. The gorge was certainly known to the native Seneca Indians but its name comes from Dr. Samuel Watkins and his brother John who acquired land in the area in the 1850s (the town was named "Watkins" in 1854 after John's death). In 1863, the Glen was opened to the public as a privately-run tourist operation until it was purchased by the State in 1906 and it became a state park in 1924. The word "Glen" was also added to town name of "Watkins" in the mid-1920s, capitalizing on the tourist appeal of the area. dot at southern end of Seneca Lake indicates the town of Watkins Glen. A beautiful trail with 800+ steps runs 1.5 miles and 500 feet of elevation gain through the Glen and I highly recommend a visit if you're in the area. As a geologist, I appreciate such places on two levels. On one level, like everyone else, I enjoy the unique scenic beauty of the area. But, since I'm fortunate enough to be a geologist, I also see and appreciate a lot of other aspects of the Glen that most people may never notice (of course, a botanist would notice all the plants or an entomologist insects - things I might be oblivious too as I walk around the world). Anyway, let's talk a bit about the geology of Watkins Glen. The geologic story of the Glen took place in two acts, each separated by almost 400 million years of time. It all started during a time geologists call the Late Devonian Period (Frasnian Age), some 375 million years ago. The world was very different back then. Below is a paleogeographic reconstruction of North America during that time. The equator, and the direction of north, is shown. State outlines give an idea of where things are today. Let's look at a close-up of New York State. The red dot denotes the Finger Lakes Region of central New York. It was under shallow seawater during this time in a subtropical climate zone just south of the equator. In eastern New York into New England there was a mountain belt which geologists call the Acadian Mountains. They resulted from the collision of a small microcontinent (which is now permanently attached as New England) with proto-North America. Just as India colliding with Asia in more recent times thrust up the Himalaya, the collision of Avalonia (the microcontinent's name) with Laurentia (what geologists call proto-North America) formed the Himalayan-sized Acadian Mountains. As these mountains eroded, the sediments were washed westward into that shallow sea. Over time, land built outward in a large wedge called the Catskill Delta. The horizontally-bedded conglomerates, sandstones, and shales of the present-day Catskill Mountains and Allegheny Plateau to the west were formed from these sediments shed from the Acadian Mountains. We know these sedimentary rocks in the Watkins Glen area were formed from sediments deposited underwater because they contain various types of marine fossils. Some of the sandstone layers in Watkins Glen also have ripple marks preserved. These are the same types of ripples one sees today under shallow marine water in sands (I got very excited to see the ones below on the main trail through the Glen). Symmetrical ripple marks on the rock walkway. Over tens of millions of years, sediments accumulated in this environment and were buried deep enough for the soft sediments to be lithified into sedimentary rock (and preserve the remains of ripples and ancient seafloor organisms as fossils). The next part of the story of Watkins Glen is more recent. These once-buried rocks were eventually brought back to the surface by erosion of overlying rocks and sediments. When buried, these rocks were under pressure. When brought to the surface, pressure was released and they expanded. When expanding, two sets of fractures developed from the tensile (pulling apart) stresses forming what geologists call an orthogonal joint set (fracture sets at right angles to each other). These are easy to see in the cliff walls of the Glen. Joints in the cliff wall of the gorge. In this area, the joints are generally oriented ENE-NNW. When rock is eroded by flowing water or glacial ice, the joint directions are preferentially carved out because the rock is weaker in those directions. Let's look at a terrain map of the area showing topography. Note that Seneca Lake is oriented NNW and Watkins Glen is oriented ENE at right angles. That's not a coincidence. They were preferentially carved along the regional orthogonal joint sets. 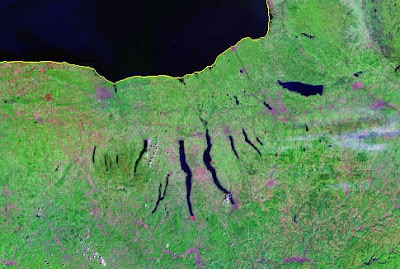 Most people probably know that the Finger Lakes were carved during the last ice age during the Pleistocene Epoch of geologic time (2 million to about 10,000 years ago). Let's imagine what this area looked like 10,000 years ago as the great glacial ice sheets melted away. Seneca Lake was a deep glacial trough (close to 600 feet deep at its deepest) filling with glacial meltwater. Glen Creek flowed into the deep trough from higher elevations to the west as a hanging valley (perhaps a spectacular waterfall at some point). Over the past 10,000 years, Glen Creek has been cutting down into the horizontal layers of sandstones and shales resulting in a deep gorge with stepped waterfalls, scalloped walls, and potholes - Watkins Glen. Tomorrow, I'll post a brief story of the 1935 flood which devastated this region. Wow - thanks for the information. The geological considerations are immense! Thanks for this information and pics! I also am into Geology and environmental science and appreciate the first hand knowledge. Thank you, Steven! I've been going to the Glen for years, and love walking through it. Your geology lesson is wonderful, and I'll be looking for those features next time I visit. Thanks for the summary. Taking my elementary school aged children for a vacation here this week. I try to add a bit of geology lesson on every hike we do. It's nice to put the proper age to a formation without having to scour the USGS.GOV pages for accuracy. Hello, I'm a life long resident of the area. I was actually looking on Google for explanation for a large sand deposit in the area. Could it be from the ancient shallow sea or is it likely just a glacier deposit? Glacial. Anything from the ancient shallow seas would be sandstone by now, not sand. I will be going there soon with my wife. I'm a degreed geologist from Oswego State College. Enjoyed your explanation and pictures. Thank you. Perhaps you could share more on the fossil aspects of the area.